He was speaking after talks with Irish leader Leo Varadkar in Brussels. Mr Tusk’s Twitter account tweeted his comments immediately after he made them in a news conference. Jean-Claude Juncker tried to laugh off the comments at a later press conference with Mr Varadkar, saying the only hell he knew was doing his job as the president of the European Commission. But leading Brexiteers in the UK took to social media to express their anger at Mr Tusk’s remarks. 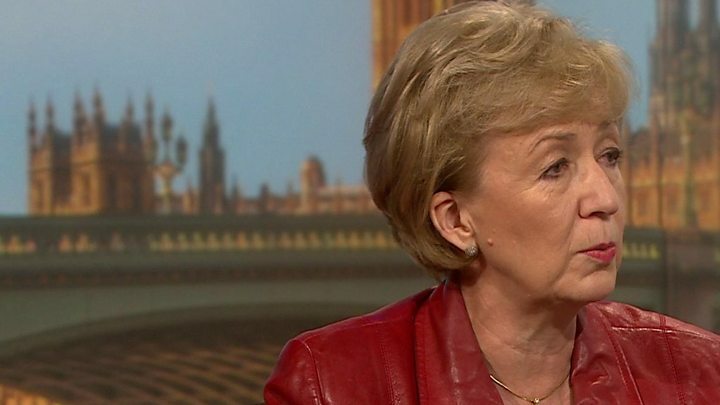 Commons leader Andrea Leadsom, who also campaigned for Britain’s exit from the EU, said Mr Tusk should apologise for his “disgraceful” and “spiteful” comments. But Sinn Fein President Mary Lou McDonald backed Mr Tusk, arguing that it was the position of “hardline” Brexit-supporting MPs like Boris Johnson and Jacob Rees-Mogg that was “intemperate” and “untenable”. And Labour MP Ben Bradshaw, who supports having another EU referendum, said Mr Tusk was “absolutely right” and it was “painful” for leading figures in the Leave campaign, such as Boris Johnson and David Davis, “to have the truth pointed out to them”. BBC political correspondent Iain Watson said the government was likely to publish a new employment bill before the next vote on Mrs May’s deal, with the aim to maximise support for it from Labour MPs. In a letter to the prime minister, he said Labour wanted a UK-wide customs union, close alignment with the single market, “dynamic alignment” on rights and protections, “clear commitments” on participation in EU agencies and funding programmes and “unambiguous agreements” on the detail of future security arrangements. He said Labour did not believe that “simply seeking modifications” to the backstop was a sufficient response. Still open to a solution? The EU has been absolutely scathing about some of the British political class today. The dam broke on Donald Tusk’s pent-up feelings about the leaders of the Leave campaign. The Irish prime minister suggested that MPs either didn’t know what they were doing or were misled when they voted to look for alternatives to the Irish backstop. But – and it’s a big but – they have all been open to the prime minister coming to Brussels with a solution to break the deadlock. And while Jean-Claude Juncker ruled out the idea of the UK having the right to pull out of the backstop if it were ever needed, he didn’t say anything about the other idea doing the rounds – a time limit. Donald Tusk said that the other 27 EU members had decided in December that the withdrawal agreement was “not open for renegotiation” – a message echoed by Mr Juncker. Mr Tusk also had a message for Remain supporters in the UK, with 50 days to go until Brexit happens, with a deal or without one, saying: “I have always been with you, with all my heart”. But he added: “The facts are unmistakable. At the moment, the pro-Brexit stance of the UK prime minister, and the Leader of the Opposition, rules out this question. Mr Varadkar said that while he was “open to further discussions” with the UK government about post-Brexit relations, the legally-binding withdrawal agreement remained “the best deal possible”. He later said he will meet Theresa May for talks in Dublin on Friday. Jean-Claude Juncker said alternative arrangements – the form of words backed by MPs in a vote last week – “can never replace the backstop”.